And things just kept getting worse. The doctors didn’t know what was wrong with me. I can’t help but wonder how many people around the world get the same prescription I did. But I have a different nickname for it: The Celiac Disease Diet. Why? Because of a very important reason – a reason that almost killed me. While removing gluten exposure is critical to the treatment of the disease… it isn’t THE only treatment. It’s just part of it. The danger lies in the promise that people with Celiac disease, who follow a strict gluten-free diet for life, will fully heal. When I followed a strict Gluten-Free diet for 2 years, believing I would be “just fine” and STILL had diarrhea 5-10 times a day, I came face-to-face with insanity. That means after 10 years of being gluten-free, HALF of all Celiacs are likely starving for the critical nutrients required for health and longevity. It’s no wonder we have a 77X increased risk for lymphoma. 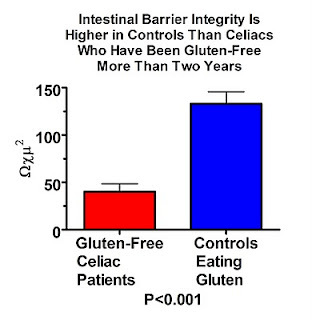 Here, they measured trans-epithelial electrical resistance (TEER) of intestinal tissue taken from gluten-free Celiacs and gluten-eating controls. TEER is an estimation of the leakiness of the gut, where a lower value indicates a greater level of leakiness or permeability. They found that tissues taken from controls who had been eating gluten had three-fold less leakiness compared to Celiacs who had been off gluten for over two years. 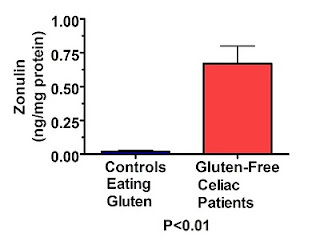 This, again, suggests that something besides gluten may be contributing to leaky gut in people with Celiac disease. Then, I got lucky and found a new doctor with new ideas about what it meant to treat Celiac disease – a new doctor that finally helped me stop my diarrhea for the first time in 6 years. My definition of reversing Celiac disease is this: turning off the immune attack against the body for good, and then repairing the damage it caused so you live a happy symptom-free life. How did you get over this? Did you see any specialist who blamed anxiety and ibs? What is your the status on pain management? I have so many questions. 2 years into the gluten free diet, low fodmop no relief and the doctors are not helpful. How do you keep your job with this constant pain and discomfort? Hi this was a wonderful article. I have not been diagnosed with Celiac Disease, but have many of the symptoms. After many years of going to doctors and complaining of the same symptoms and getting no help, no testing, just prescription to treat the symptoms. I decided to do my own search for the symptoms I’m experiencing and just read about Adison’s disease which has many of the same type of symptoms as Celiac. Apparently Adison’s disease can cause Celiac disease, which may be why a gluten free diet is not working for many patients diagnosed with Celiac disease. Adison’s disease is caused mainly when adrenal glands do not produce enough of the hormone cortisol, but there can be other reasons as well. Here is a link to the article I read for anyone who wants to read it. You may also want to do your own search on Adison’s as there are many articles out there by medical institutions about it as well. https://pituitary.org/knowledge-base/disorders/adrenal-insuffieciency-addison-s-disease. Hi Betty – Remicade is a prescription that deals with the symptoms, not the root cause and we therefor suggest the approach talked about in the article for lasting changes that address the root of the issue. My girl friend is celiac just about a year. Shes still devastated hates to est anything and is about 105 pounds when she used to be likd 145. I’m a cook and I know what she can eat ahat she cant I know the whole nine yards. But fixing leaky gut can help her gain weight again? Hi Steven – yes it can definitely help her gain weight. Of course there are many factors that play into this, but essentially her gut is likely not absorbing nutrients even though she’s eating food. Hormones can play a part, too, but healing the gut with diet and supplements is a great start. Hi guys. I wanted to attend, but the register page is coming back with “Did not process request from due to Spam Sources.” There is no chance that spamming is happening from here. Must be some error from your spam list provider. I do not have this problem with any other Internet communications. In the meantime, I guess I’ll try from another location. My wife started out being extremely lactose intolerant. She had colitis throughout her entire GI tract before she began to cut out all lactose. It took us 5 years of struggling before we really had a handle on it. For instance, lactose free milk is only lactose free if it is skim milk because some of the lactose is in the milk fat and the lactase enzyme is not able to treat it. Fifteen years after becoming lactose intolerant, she became celiac and that was another learning curve. She is ok just as long as she receives zero gluten. Because she is so sensitive to lactose and gluten, we were able to eventually track down foods that contained these and eliminate them. Product ingredient labeling has helped a lot but some products do not inform the consumer of minute amounts of lactose or gluten. Am just been frustrated on the issues of this celiac diseases, whatsoever I tried which is not gluten is still pronouncing, I really need your help. Can you please come to the doctors with me? It’s been around 7 years since my first symptoms and at least 3-5years fighting with doctors. 2 years ago I almost bankrupt myself at a natural path doctor who brought to life I was more then likely celiac…..no one will diagnos me with anything other then ibs….I seriously feel like I’m going to die somedays…..even after 2 years of a strick celiac diet, which includes no vinigars and only olive oil as well as I am intolerant to dairy, even goat. Sometimes if I just stop eating for a few days, I feel better, but then not eating catches up to me and it feels like a mini stroke is coming on. Finally something came up on a blood test with thyroid and graves was the first thing the doctor said. I’m beyond my breaking point. I can hardly hold down a job because of sick days and doctor days…..I don’t want to say I hate my life because I love it and everyone in it….it’s just this celiac thing is such a huge part of my life unfortunately….it needs to stop right now, today, but I am not equipped with the knowledge or resources to even point my doctor in the right way…..is there something I can take her? Oh I forgot to mention I have inflammation too, real bad in my right heal, side leg and knee…… so bad i can’t be on my feet long w/out resting leg/foot. and I take curcumin and tart cherry but it doesnt help. Nothing does, except maybe changing shoes for a bit. Hi, have you ever seen a vascular specialist for that? Might be something they could do. Hi Kimberly – thanks for reaching out. I’m sorry you’ve been struggling, but I’m really glad you’ll be joining us for the webinar on Wednesday. I think the majority of your questions will be answered at the webinar – including what to eat and avoid and what triggers a leaky gut. Hi Kimberly, do you mean that gut powder and jelatin did not healed your leaky gut? My son is nearly 4 years old and he has chronic diarreah. He has had it all his life. I have had him on a gluten free diet which did help significantly however there are other people in my sons family that give him gluten thinking it is only a little bit, and that he will be ok. I have no control of his diet when he is not with me. Doctors have found nothing wrong with him but there is definitely something wrong. I’m looking forward to hearing what you have to say. Hi Laura – your daughter is so fortunate to have been diagnosed at such a young age! Dr Joel Wallach and Dr Peter Glidden have some interesting ideas. Hi Cherie – so sorry you experienced this problem! It sounds like it was a little glitch – we hope you’ll try registering again. You might also want to try a different browser or device, too. Wow what a great article! I was diagnosed with Celiac’s over a year ago, and although I don’t experience any digestive discomfort I still have very low vitamin levels and (all of a sudden) bad acne. I am currently in the slow but steady process of healing my leaky gut.